Matt 15:14 ...when one blind man leads another, both fall into a ditch. Some message believers look at the evidence of Failed Prophecies that we and others have presented and state "You just don't believe" and then advocate a kind of "blind faith" that requires true believers to ignore any negative evidence. 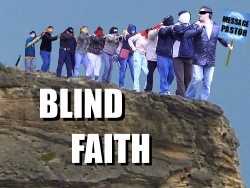 1 Isn't blind faith good? 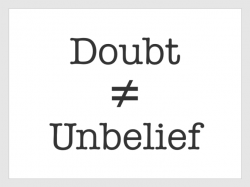 Message believers are hesitant to embrace an evidential faith. They think faith that requires evidential support as weak and inferior, while blind faith (a faith that simply trusts without question) is the truest, most sincere, and most valuable form of faith that we can offer God. Without any other context to understand what Jesus believed about the relationship between evidence and faith, this single sentence (“Blessed are they who did not see, and yet believed”) does sound like an endorsement of faith independent of evidential support. But context changes everything. Like other declarations offered by Jesus, this statement has to be reconciled with everything else Jesus said and did before we can truly understand what He believed about the role of evidence. Yet Jesus also seemed to have a high regard for evidence. In John 14:11, He told those watching Him to examine “the evidence of the miracles” if they did not believe what He said about His identity. Even after the resurrection, Jesus stayed with His disciples for an additional forty days and provided them with “many convincing proofs” that He was resurrected and was who He claimed to be (Acts 1:2–3). Jesus understood the role and value of evidence and the importance of developing an evidential faith. It’s time for all of us, as Christians, to develop a similarly reasonable faith. John makes an important statement right after the line that is typically offered to “demonstrate” Jesus’ alleged affirmation of a non-evidential faith: “Therefore many other signs Jesus also performed in the presence of the disciples…”. What? Blessed are those who did not see and yet believed, therefore many other signs Jesus also performed in the presence of the disciples? Do you see the contradiction here if Jesus was speaking against evidence? Why would Jesus continue to provide evidence if those who believe without evidence are supposed to be blessed? Jesus is talking here about all the people (like you and me) who will believe in Jesus not because of what we will see with our own eyes but because of what the disciples saw and recorded as eyewitnesses (“their word”). Yes, Thomas was blessed to believe on the basis of what he saw, but how much more blessed are those who will someday believe, not on the basis of what they will see, but on the basis of what the disciples saw and faithfully recorded. ↑ J. Warner Wallace, Cold-Case Christianity: A Homicide Detective Investigates the Claims of the Gospels (Colorado Springs, CO: DavidCCook, 2013). This page was last edited on 2 June 2016, at 18:02.